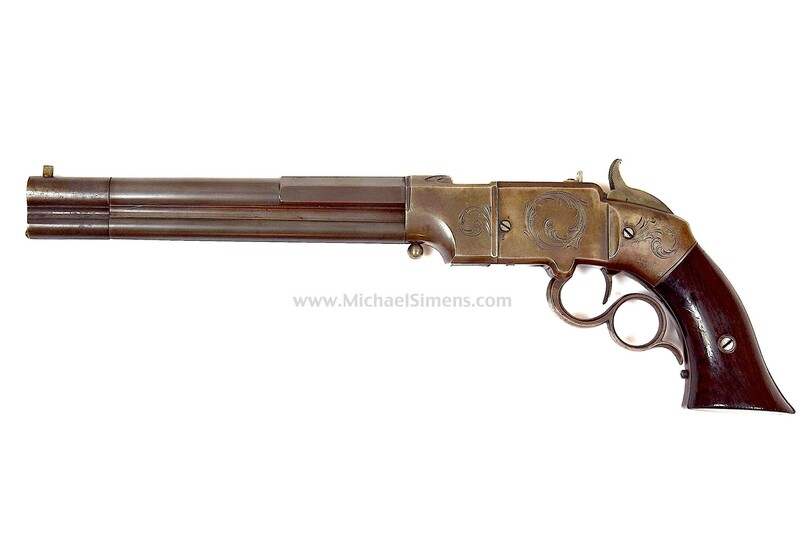 A very fine Smith & Wesson Volcanic, this gun is in extremely fine condition. At some major auctions, we may leave low-ball bids on as many as 50 - 100 items hoping for a prize or two at a very at a low price. Such was the case with this gun when we stole (purchased it) at a recent auction.This fine No. 2, Large Iron Frame is a bargain even with our mark-up. 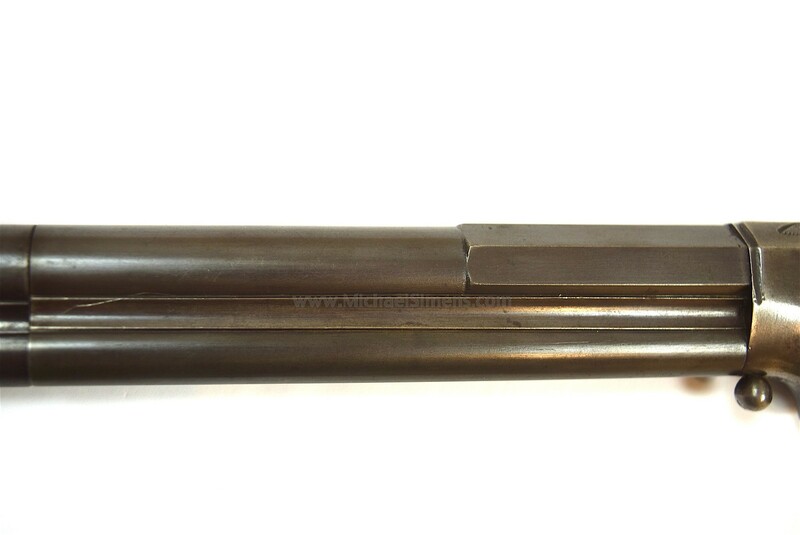 Manufactured by S&W in Norwich, Connecticut, c. 1854-55 and chambered for the self-contained, 41. caliber Volcanic cartridge, this pistol has the part-round / part-octagon barrel with 10-shot integral magazine, toggle link lever and two-piece rosewood grips. This early production pistol has the Type I features which include: (1) un-crowned muzzle, (2) flat magazine locking spring, (3) round, slotted follower, (4) single spring screw on the bottom of the receiver, (5) lever with spur on the finger hole and (5) frame with hump behind the hammer. The top and sides of the frame, side plates, back strap and hammer are engraved with open scroll and leaf style engraving usually found on S&W No. 2 pistols. 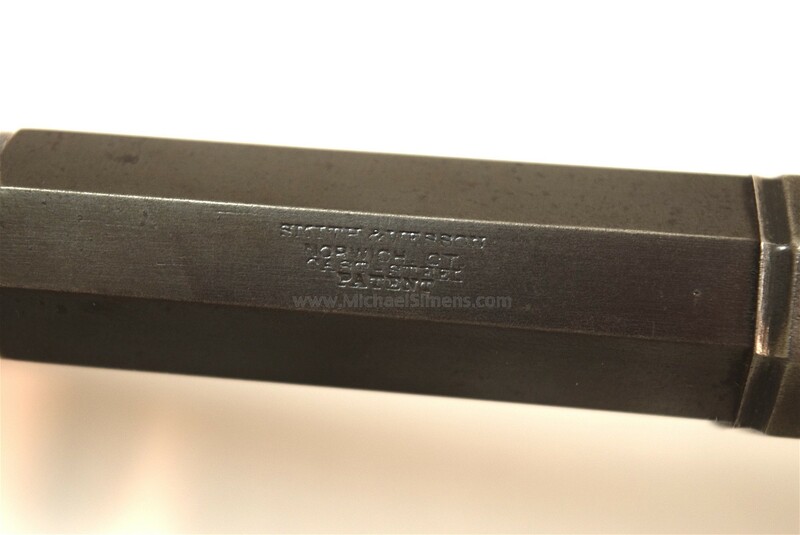 The top of the barrel is stamped: "SMITH & WESSON/NORWICH CT./CAST STEEL/PATENT" in four lines. Total production of the S&W No. 2 large Frame Lever Action pistols is estimated at under 500 pistols. The barrel retains 80% plus original blue finish starting to age with an attractive plum brown patina and the balance of the gun shows patina mixing with a dove gray. The surfaces are smooth with the exception of some specs of corrosion on the left side of its muzzle. Other than that, the edges are extremely sharp, the barrel markings are clear, the screw-heads are in great shape and the gun shows very little use and/or handling.The hammer spur has fine, sharp knurling and the only flaws I can find are a replaced front sight. The S&W No. 2 Lever Action pistol is rare. 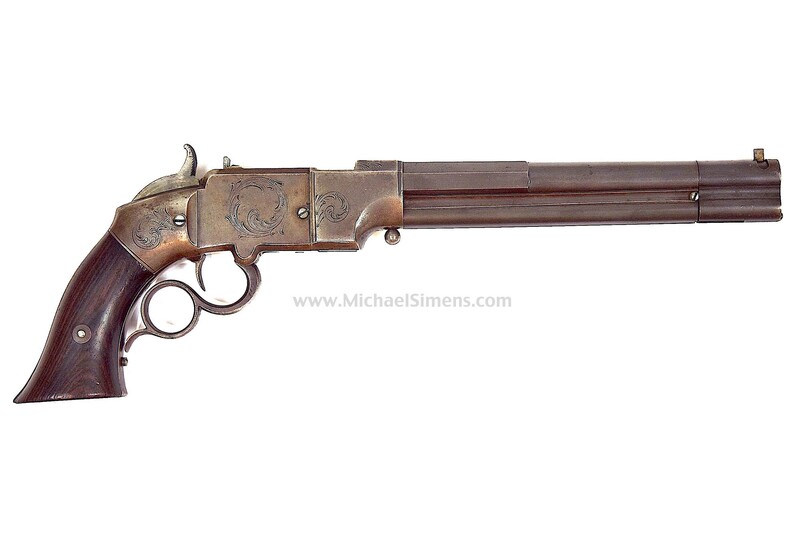 It is a key piece in any advanced Smith & Wesson or Winchester collection, and the few surviving examples are difficult to obtain and highly prized in this condition.